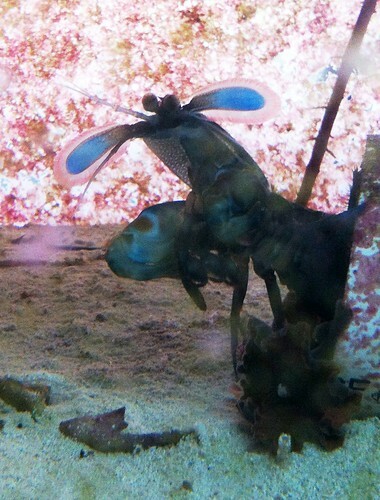 The back side of the tank is on the right. The refugium is on the top left. 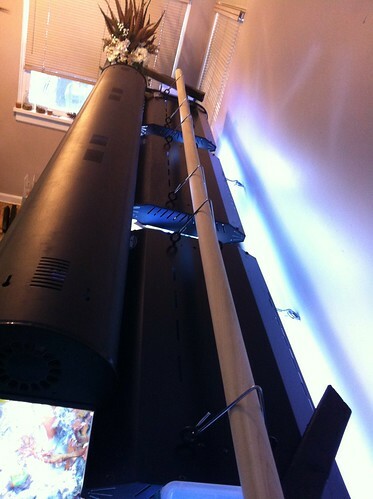 On the bottom left I use a 90 gallon tank to make saltwater for water changes. At the last house this tank was set up using bio balls in each one of the overflow boxes to limit noise. This time I decided not to use bio balls and boy let me tell you, I had a small Niagara Falls in my basement! I could hear the bassy tones all the way upstairs. So, here’s my attempt at making a 2 inch PVC standpipe to quite the tank. 2″ PVC Elbow for the standpipe that is in the overflow box. Looking down inside the overflow box. Didn’t have much room to install that stand pipe, especially when half of the overflow box opening is covered by a cross brace. Putting the standpipe together was a tight fit! I had to use an elbow to get around the return line. 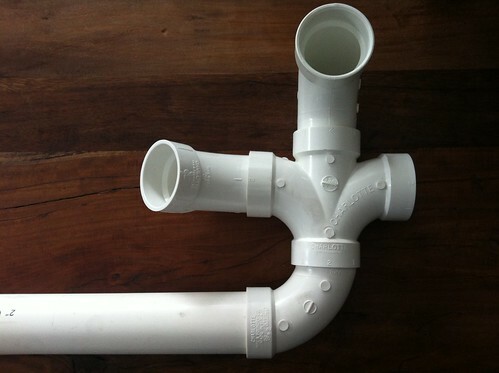 I also had to cut the sides of the PVC fitting to squeeze them into place. A back side shot of the tank. I really like the 100 gallon Rubbermaid stock tank so far for the sump. I like that I can drill holes into the sidewalls fairly easily. For now I will use this DIY filter media box made from some plexiglass and a couple stackable recycling containers. I have PVC unions installed in case I want to switch out the box and pump setup. A shot from under the tank. Pretty clean so far. The stand got a couple coats of polyurethane over the dark grey paint. Using our dishes to keep the sand from being blown everywhere on the fill up. They came in very handy! Filling up the freshly painted tank. Really liking the Knight’s Armor color. Adding salt to the aquarium made for quite the whiteout. Stormy Weather and Down Power Lines… Do you have a generator for your fish tank? With all of the bad weather lately it’s a good idea to have a generator or backup power source on hand. One of my friends, who lives in a remote location, had some bad weather the other day that knocked his power out for 9+ hours. Luckily for him he had a generator to run his tank’s pumps and heaters. Lack of water circulation will kill corals in a hurry! Personally, I have a large UPS (uninterruptible power supply) to protect against power surges and short-term power outages. I also have backup batteries on my VorTech MP-40 pumps to keep them running for up to 30 hours. My UPS will keep my big return pumps going for 20+ minutes which is longer than most power interruptions in our town. What is your fish tank plan for a power outage? Got home from working out this evening to see my Zebra Eel completely out of the rocks. Looks like he was very hungry! Comments Off on The Eel is Out! It seems like most stores try to sell you the tank, maybe some lights, then explain to you that you have to add salt to the water, lol. The rest is figured on through what feels like frustration and hearsay. You then have to buy a stand, rock, sand, skimmer, RO/DI unit, holding tank(s), testing equipment (pH, alkalinity, calcium, magnesium, nitrates, phosphates, etc), additives (alkalinity, calcium, magnesium, etc), pumps (water movement and mixing salt), heaters, lights (because the ones you got upfront were cheap and didn’t grow the corals you wanted to), additive dosers (optional), controller (optional), Auto Top Off (ATO) for evaporation (optional), chiller (optional), battery backup or UPS (optional), ultraviolet sterilizer (optional), filter pads/media, salt, etc. Granted a lot of the things mentioned above are optional but they save you time, money and give peace of mind for the long-term. I believe all of that “optional” stuff is pretty much a necessity if you plan on having a reef system (past the average 2.5 years) and having a LIFE. It’s nice to be able to leave for the weekend, or longer, and know that most things are automated and if there is a problem you can be notified by text or email from your controller. Fortunately there are a lot of online forums (Reef Frontiers, Reefland, Reef Central, etc.) and resources (ex. Wet Web Media) to help newbies figure out and ask themselves a lot of the questions that should have been asked before buying a tank/system and occupants. I’ve been in the hobby for around 8 years and am still using these resources to learn new tips and tricks. I truly believe that if most people knew the costs and resources involved upfront they would probably not get into the hobby, or they would prepare themselves a bit better. Installed two more energy bars for my Apex AquaController over the 4th of July break. After mounting and plugging them in I began to program each outlet starting with lights, chiller & heater then eventually moving on to Cal, Alk & Mag dosing pumps. I am really happy to get all of these components “online” with each other. I was also able to take a lot of timers and extension cords out of the system, another big plus! A couple of weeks ago I installed a Neptune System Apex AquaController unit and I must say that I am very happy with it, but for $500 I hope I would be. I haven’t quit started to hook up my pumps and lights to the energy bar yet but the monitoring probes (temp, pH & ORP) have been working well. I also really like the iPhone app that makes my system accessible and controllable from anywhere with a signal. 🙂 The email and text alerts work very well too! I really like the scalability options, should make upgrading to another system fairly easy. After reading the owner’s manual and doing the math it became clear that I needed two more energy bars to plug all my accessories in. I currently pull power from three different circuits so each would require it’s own energy bar (controllable power strip). I also would like to get the wireless unit to control my Ecotech VorTech MP40 pumps. 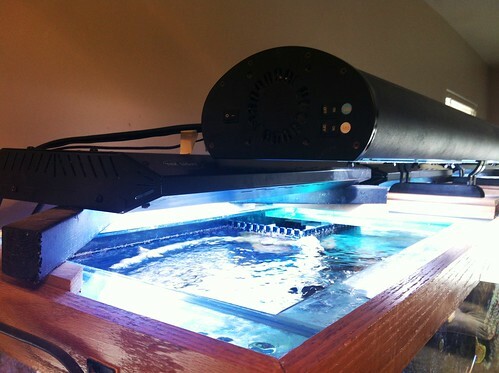 So about another $500 should take care of my aquarium controlling needs… I hope. Just getting around to posting this up. I think it’s useful information that someone might like to know. On advice of friends in the saltwater aquarium hobby I try to clean my Mag drive pumps (main returns & refuge) every 1.5 – 2 years. In the past I’ve accidentally ran a set of Mag Drive 24 pumps to exhaustion (~3 years and their insides fused together). In this post I will show you how I clean my pumps! I started this process at 11:00 AM and finished at about 4:00 PM. Start by turning off metal halides (just in case). Turn off Automatic Top Off (ATO). Get buckets & pump ready for display tank’s head water (4 – 5 gallon containers for me). Turn off main return Mag Drive 24 pumps (2). 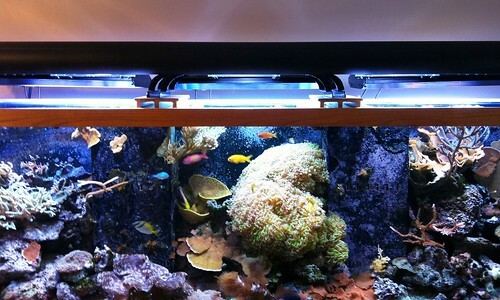 Use small pump (700 gph) to pump out head water from sump into containers (as it drains down from the display). Cover exposed SPS corals with damp paper towel – keep wet for duration of change – Also check to make sure slow moving creatures aren’t left out of the water (ex. cucumber). Remove Mag Drives and place in large cantainer, tote in my case (12:oo PM). Fill with white vinegar – I used 5 gallons. Run for three hours – Be sure to have your pumps some what covered in case they flip over and pump liquid up and out! Also keep in mind the vinegar temp. My large Mag Drive 24’s inside of the closed tote headed the vinegar up after a while so I cracked the top a bit and added a little cold water. Check aquarium temperature to make sure temp is normal. Make adjustments if need be. Rinse pumps in freshwater, clean off any debris and look for any problems. Some people take their pumps apart and check the shafts for wear and tear but I did not. The last Mag 24 I tried this with I was barely able to get the magnet/shaft back in the pump without breaking it (very strong pull and little to hold on to). Re-install pumps on new vibration pad (I use a heavy filter pad). Have many containers on hand! Lots of white vinegar for cleaning all aquarium pumps! Mag Drive 24 Pump label. Looks good as new… almost. Rinse, clean & re-install pumps. I used to have vinyl tubing but PVC and unions works much better! Turn return pumps back on and you get lots of micro bubbles!